Arleen Rodríguez: Hello! A greeting to all of those who are watching Cuban Television right now. I welcome all of you, along with the former President of the United States, James Carter, who just moments before leaving to return to his country has graciously agreed to give us an interview, and an exclusive statement for our television broadcast. Jimmy Carter: It's a great pleasure to return to Cuba, to Havana. Rodríguez: It's a great pleasure to have you here as well. You told me that you'd like to say something to the Cuban people before our interview. Rodríguez: The camera is yours. Carter: To the people of Cuba I would like to say that I am very grateful for the chance to return to your wonderful country once again. My wife and I enjoy being here with the Cuban people, to meet with the government leaders, to meet with some of those Cuban citizens who disagree with the government. We met with all of them. We are very excited about the prospects for the upcoming Congress that will begin next month. We also had a chance to meet with the parents of the so-called Cuban five, with two of the mothers and also with the wives. My hope is that in the future we will see normalization of relations between Cuba and the United States. I would like to see at the time all the restraints on travel from the United States to Cuba and Cuba to the United States lifted, and also have freedoms in both our countries, freedom of assembly, freedom of speech, freedom to travel as you wish, these are very important for the entire world and for the people of Cuba. We had meetings with the foreign minister, with the President of the National Assembly, with President Castro, with the former President, Fidel Castro, an old friend of mine, to learn all we can about the economic changes in Cuba. This morning I was also able to meet with Mr. Gross, who has been sentenced to a long term in prison in Cuba, and we believe he is innocent of any crime. I hope in the future we'll see his freedom along with the freedom of the so-called Cuban Five who have now spent 12 years in prison in the United States. In the future I hope that we can see unimpeded trade and commerce as well as travel back and forth between our two countries and I'd like to see the economic embargo lifted completely...it doesn't just affect the government but it hurts the people. My views on the Cuban American relationship are that it needs to change. When I became president I immediately lifted the travel restraints between both my country and Cuba and I have worked very closely with your former President Fidel Castro to establish diplomatic exchange through Interests Sections. Now the United States and Cuba have about 300 people employed in the Interests Sections, both in the United States as well as in Cuba, and there are Cubans who work in the Interests Section in Cuba and vice-versa, and I think that this can contribute to normal diplomatic relations between the two countries. This has been a good opportunity that I've been given by Cuban TV to address you and say how marvelous your country is. Rodríguez: Thanks. I'd like to take advantage of this opportunity to ask you a few questions. First of all, I'd like to congratulate you for the respect and sympathy that you've generated as the only U.S. President in 50 years to do something to normalize relations. You recalled some of the important steps. 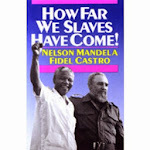 Also for the fact that you have come to Cuba twice already, and for doing so with your hand extended and with respect. The Cuban people, who have a lot of pride and dignity, receive such visitors sympathetically. I believe that, getting down to the substance of this interview, you've relieved me of having to do an introduction, by expressing once again your desire and willingness for the blockade against Cuba to be lifted. It's known that there's a majority consensus in U.S. society on this, even among the Cuban community in the United States, and that, furthermore, the international community has overwhelmingly demanded this for the last twenty years, the same way that its efforts are supported by a vast majority in Cuba and the United States. As you yourself acknowledge, the blockade remains in place, and the Cuban people know, furthermore, that it remains in place as stiffly as ever, sometimes even more rigorous than before. I ask: What prospects do you see for relations between Cuba and the United States and for this blockade, that the whole world opposes? Carter: As you know, the majority of Cubans want to have normal relations with the United States, and the overwhelming majority of North Americans also want to have normal relationships with Cuba. Unfortunately there are a few radical leaders in my country, some in prominent positions in Congress, mostly Cuban Americans, who insist on keeping the relationship between our two countries separate, these representatives of the old Cuban American community, whose main goal was to overthrow the Castro regime; even among the Cuban Americans now in my country they are a small minority now, but they're very powerful, in our political circles. 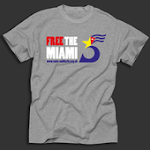 I believe that in the last few years, I've seen public opinion polls even inside Miami ... testifying that the younger members of that community want to move the economic blockade against Cuba and want to have normal opportunities to travel in both directions: from the United States to Cuba and also from Cuba to the United States. This is a change. In my opinion, it's a change that is going to continue into the future and I hope that my small voice, and the opinion of many American, can make this a reality. Rodríguez: Mr. Carter, I was very moved as I listened to you in the press conference, and here in your statement, when I heard you also ask for, demand, freedom for the Five Cuban Heroes imprisoned in the States, who Cuba considers heroes, because they faced terrorist groups and were able to prevent the list of 2,099 wounded and 3,478 dead from terrorist attacks on our country from growing any larger. I don't know how aware you are of how deeply the Cuban people feel about the demand that the Five be released. However, I didn't hear you say they should be pardoned. You said that according to U.S. law you expected that they would be freed. They have appealed to the Supreme Court, which refused to hear their case, despite the fact that more than 10 Nobel laureates and hundreds of political personalities and intellectuals around the world had demanded it. In other words, all the legal steps have been exhausted. The process has been extremely arbitrary, as you said, judges have acknowledged this, and two of them have been subjected to the additional punishment of being denied regular visits from their wives, as well as having the visits from their family members made very difficult. To arrive at this point with the Supreme Court and not allow even for the review of such a complex case is what made these Nobel prizewinners and political personalities demand that Obama grant a pardon. You were the President of the United States. You exercised the right to pardon, as a humanitarian gesture, that I tell you - as a Cuban - the Cuban people would deeply appreciate a pardon. Are you inclined to add your name to the other Nobel prizewinners who are asking Obama to pardon the Five? Carter: As you know, I'm not only a former president, but I'm also a Nobel laureate. Carter: Well, in my private talks to President Bush and also with President Obama, I have urged the release of these prisoners. I recognize the restraints within the American judicial system, and my hope is that the president might grant a pardon, but you have to realize that this is a decision that could only be made by the president himself, it would be presumptuous of me to try to tell another president what to do; but the presidents, now and before this, have known that my own opinion is that the original trial of the Cuban Five was very doubtful, it violated standards, and also some of the restraints on their visitation were extreme. Now I know that all of the people have been able to visit them in jail, and it is my wish in the future that before a pardon might be granted is that there could be more access by these families to these prisoners. I have been informed by officials, for instance, that the shooting down of the small plane[s] over Havana, that caused the death of two pilots, was done after the President of the United States informed Cuban leaders that no more flights would take place. And I was informed by Cuban officials that they notified the President of the United States very clearly, that they could not permit a plane to fly over their capital city...dropping leaflets...but that they would protect the sovereignty of Cuba. So even those more serious allegations, in my opinion, are very doubtful, about their need or cause of the extensive sentences that have been granted to one of the prisoners. So in every way, in my private report with Obama when I return to the United States, in my public statements like today, in my previous conversations with American leaders, I've called for the release of the Cuban Five. One of the reasons is that, guilty or not, they've served a long prison sentence already, more than 12 years, and the fact that they've been punished adequately, even if they are guilty. Rodríguez: Recently a person very closely connected to the case, who you knew very well, Leonard Weinglass, passed away. I know that you know he was a man with a love for justice, who fought for justice, and his last words, his last work, even, on his deathbed, was to prove that the Five had nothing to do with the downing of the planes. Rodríguez: To go further into the case would make this conversation much longer, but what the Cuban people know, what can be proven, what is known, even by U.S. authorities, through the reports that Cuba sent, is that the only thing these young people were doing was looking for information to prevent terrorist actions. I am confident that you will be able to convey the insistence on a pardon, as a humanitarian gesture. These men have suffered a lot, and have lost family members without being able to be at their side; finally, I don't insist, I thank you for your interest and your statements in the name of the Cuban people. Mr. Carter, you also said this morning at the press conference that you had a friendly meeting with Comandante Fidel Castro, who has expressed in his Reflections a great deal of anguish about the risks faced by the human species, about the huge nuclear arsenals that keep on growing and that are capable of destroying the world several times over, and also about the nefarious consequences that climate change might have for the human species. These are subjects in which I believe you have broad agreement. As a nuclear physicist, you know what nuclear weapons mean for the human species, when you were President, you worked hard to educate your people against consumer culture, promoted rational policies, defended the environment, even though it made you unpopular among certain sectors. Well, quickly, I'd like to know if you still think there is a chance to do something to save humankind. 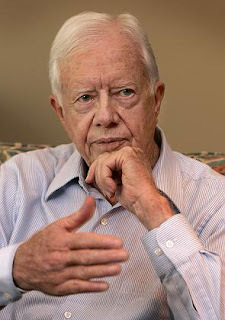 Carter: Well, when I was president, we negotiated with the Soviet Union to reduce the level of nuclear weapons, through the so-called SALT II Treaty, and since then I've been a strong advocate of reducing productions in nuclear arsenals on both sides. Also I believe very strongly that there is a real threat to the wellbeing of all human beings through global warming, and as you probably know, President Obama and his predecessor, President Bush, attempted to work with other nuclear powers on reducing arsenals, and that they have been monitoring very closely the agreements that have been signed by these governments. I think the United States has not been adequately strong in its potential leadership in addressing the global warming issue. Cuban officials, since I've been here, have pointed out me that the old city in Havana is in danger of destruction... I have been to Bolivia to meet with Evo Morales, and maybe Bolivia will be the first country that will have major damage to its economy, because the glaciers in the mountains of Bolivia are melting...their source of drinking water. So I'm hoping that in the future, this issue, and the global warming issue, can be addressed by my country and all nations, and I know that Fidel Castro is addressing this now, at least in his Reflections. I talked to him about inviting ... more definitively about his actions at present, as related to the United States ... what goes on in current affairs, and he wants to use his voice as a senior statesman for the wellbeing of all humankind. We've had good conversations, we basically agree on many things, and above all, we also talked about global warming, and I believe that there might be a possibility between our two countries. Now I'm afraid I have to leave, to get on my airplane, I don't have an Air Force One any more. Rodríguez: I'm very grateful for your time. Thank you. Every time you come to Cuba, hope is awakened, although the blockade continues to make relations so difficult. Carter: I hope that we can return again, many times. I'd like to bring all my family. There are a lot of us. We have thirty-six members: grandchildren, great grandchildren, spouses, children, we'd like to have all of us come to Cuba. Rodríguez: Thank you, Mr. Carter, very much. Arleen Rodríguez: ¡Hola! Un saludo a todos los que a esta hora están en sintonía con la Televisión Cubana. Les doy la bienvenida, junto al expresidente de Estados Unidos, James Carter, que minutos antes de partir de regreso a su país ha accedido gustosamente a darnos una entrevista, una declaración exclusiva para nuestra televisión. James Carter: Es un gran placer volver a Cuba, a La Habana. Arleen Rodríguez: Es un gran placer tenerlo también. Me comentaba que quería decirle algo al pueblo cubano antes de nuestra entrevista. Arleen Rodríguez: La cámara es suya. James Carter: Quisiera agradecerle al pueblo de Cuba la posibilidad de estar de nuevo en este país para poder reunirme con los líderes cubanos, para reunirme con algunos ciudadanos cubanos que están en desacuerdo con el gobierno. Hemos estado muy estimulados en cuanto a las posibilidades de la reunión que va a sostenerse en el Congreso el próximo mes. También tuvimos la posibilidad de reunirnos con los familiares de los cinco patriotas cubanos, con sus madres, con sus esposas. Espero que en el futuro haya relaciones diplomáticas normales entre Cuba y Estados Unidos. Quisiera también que llegara el momento en que las restricciones de viajes desde Estados Unidos a Cuba y de Cuba a Estados Unidos puedan ser suspendidas, y también que pueda disfrutarse de libertad, de reasociación, de viajes. Creo que es muy importante para todo el mundo y para el pueblo de Cuba. Hemos sostenido reuniones con el Ministro de Relaciones Exteriores, con el Presidente de la Asamblea Nacional, con el presidente Raúl Castro, con el anterior presidente, Fidel Castro, quien es mi amigo personal, y haremos todo lo posible para que se produzcan cambios económicos en Cuba. Esta mañana también me reuní con el señor Gross, quien ha pasado un largo tiempo en prisión en Cuba, y pensamos que es inocente de cualquier delito. Espero que en el futuro pueda ser liberado conjuntamente con los llamados cinco cubanos que han pasado 12 años en prisión en Estados Unidos. En el futuro espero que puedan desarrollarse el comercio y los viajes entre ambos países y que se pueda suspender totalmente el embargo económico, que es una opresión para el pueblo cubano, y que no solamente afecta al gobierno cubano, sino que es el pueblo de Cuba el que más se afecta. Considero que las relaciones entre Estados Unidos y Cuba deben cambiar. Cuando pasé a ser presidente, suspendí las restricciones de viajes entre ambos países y he trabajado muy de cerca con el presidente Castro para establecer intercambios diplomáticos. Ahora Estados Unidos y Cuba tienen a 300 personas empleadas en la Oficina de Intereses, tanto en la de Estados Unidos como en la de Cuba, y trabajan cubanos en la Oficina de Intereses en Cuba y viceversa, y creo que esto puede contribuir a las relaciones diplomáticas normales entre los dos países. Esta ha sido una oportunidad que me ha dado la Televisión Cubana para poder dirigirme a ustedes y decirles cuán maravilloso es su país. Yo quiero aprovecharme de esa oportunidad para hacerle unas preguntas. Quiero, primero que todo, saludarlo con el respeto y la simpatía que ha generado el único Presidente de Estados Unidos que en 50 años hizo algo por normalizar las relaciones. Usted recordaba algunos de esos pasos importantes. El hecho también de venir a Cuba ya por dos veces y hacerlo con la mano extendida y con respeto. El pueblo cubano, que es muy orgulloso y digno, recibe con simpatía visitantes así. Creo que, entrando en materia, usted me ha relevado de hacer una introducción al expresar nuevamente su voluntad y deseo de que se levante el bloqueo a Cuba. Se sabe que hay un consenso mayoritario en la sociedad norteamericana, que incluye a la comunidad cubana en Estados Unidos, y que, además, la comunidad internacional lo ha demandado en los últimos 20 años de manera masiva, de manera que sus esfuerzos son acompañados también por las grandes mayorías en Cuba y en Estados Unidos. Como usted mismo reconoce, el bloqueo se mantiene, y los cubanos y las cubanas sabemos que se mantiene, además, con el mismo rigor de antes, y a veces aprieta un poquito más. Yo pregunto: ¿Qué perspectivas usted les ve a las relaciones Cuba-Estados Unidos y a ese bloqueo, contra el cual está todo el mundo? James Carter: Como usted conoce, la mayoría de los cubanos desean que existan relaciones normales con Estados Unidos, y la gran mayoría de los norteamericanos también desean que existan relaciones normales con Cuba. Indudablemente existen algunos líderes radicales en mi país, algunos en posiciones destacadas en el Congreso, en muchos de los casos cubanoamericanos, que insisten en mantener este distanciamiento en las relaciones entre ambos países, estos representantes de la antigua comunidad cubanoamericana, cuyo objetivo fundamental era derrocar el régimen de Castro; incluso, entre los cubanoamericanos en mi país existe una pequeña minoría en estos momentos, pero muy poderosa desde el punto de vista político, en los círculos políticos. Considero que en los últimos años ha habido algunos progresos porque, incluso, la opinión pública dentro de los círculos de Miami y de los cubanoamericanos, incluso, los más jóvenes dentro de esa comunidad desean que se levante este bloqueo económico y tener oportunidades normales para poder viajar en ambas direcciones: de Estados Unidos a Cuba y de Cuba a Estados Unidos, esto es un cambio. En mi opinión es un cambio que va a avanzar en el futuro y espero que mi pequeña voz, así como la opinión de muchos norteamericanos, puedan hacer que esto se materialice. Arleen Rodríguez: Señor Carter, le escuché con mucha emoción en la conferencia de prensa, y aquí en la presentación le escuché pedir, demandar también la libertad de los cinco cubanos héroes, que Cuba considera héroes, porque enfrentaron a grupos terroristas y lograron evitar que creciera la lista de 2 099 incapacitados y 3 478 muertes que ha ocasionado el terrorismo a nuestro país. No sé hasta qué punto usted es consciente de cuán sensibilizado está el pueblo de Cuba con la demanda de libertad para los Cinco. Sin embargo, es decir, no lo escuché pronunciarse por el indulto. Usted decía que según las leyes norteamericanas usted esperaba que fueran liberados. Ellos han apelado a la Corte Suprema, que les denegó la revisión del caso, a pesar de que era una demanda de más de 10 Premios Nobel y centenares de personalidades políticas e intelectuales de todo el mundo. Es decir, agotaron todos los pasos legales. Ha habido muchas arbitrariedades en el proceso, como usted decía, reconocidas por jueces, y ellos han recibido un castigo adicional al privarse a dos de ellos de la visita regular de sus esposas, con dificultades también para la visita a los familiares. Llegar a ese punto de la Corte Suprema y que no les permitieran una revisión de un caso tan complejo, hizo que estos propios Premios Nobel y personalidades políticas demanden al presidente Obama el indulto. Usted fue presidente de Estados Unidos, usted ejerció el derecho del indulto, como un gesto humanitario que le digo -como cubana- que agradecería profundamente el pueblo de Cuba, ¿estaría dispuesto a sumarse a otros Premios Nobel que piden el indulto de los Cinco a Obama? James Carter: Como usted conoce, no solamente soy un antiguo presidente de Estados Unidos, sino también un Premio Nobel. James Carter: O sea, en mis conversaciones privadas con el presidente Bush y con el presidente Obama, he hablado acerca de la liberación de estas personas. Reconozco las limitaciones dentro del sistema judicial de Estados Unidos, y espero que el Presidente pueda conceder este indulto; pero esta es una decisión que solamente puede tomar el propio Presidente, o sea que no me correspondería decirle al Presidente lo que debe hacer; pero el Presidente, tanto antes como ahora, sabe que mi opinión es que el juicio de los Cinco fue muy dudoso, que se violaron normas, y que las restricciones acerca de sus visitas fueron extremas. Ahora, sé que ya esos familiares han podido visitarlos, y espero que en el futuro pueda concederse este indulto y que pueda haber también un mayor acceso de sus familiares a estos prisioneros en Estados Unidos. Me han informado unos funcionarios, por ejemplo, que el derribo del pequeño avión en La Habana, que hizo posible la muerte de dos de los pilotos, tuvo lugar después de que el Presidente de Estados Unidos informara a los líderes cubanos que ya no habría más vuelos. Los funcionarios cubanos me comunicaron que expresaron muy claramente al Presidente de Estados Unidos que no podía permitirse el sobrevuelo de la capital del país dejando volantes, y que tenían que proteger la soberanía de Cuba. Así que aun cuando esto es algo más serio, es un alegato más serio, en mi opinión, tengo dudas en cuanto a estas extensas condenas a las que fueron sometidas estas personas; pero cuando regrese pienso conversar con el presidente Obama, aquí está mi declaración pública, la he hecho antes con otros líderes norteamericanos, y hemos hablado a favor de la liberación de los Cinco; una de las razones, ya sean culpables o no, es que ya han pasado un largo tiempo en prisión, más de 12 años; o sea, que ya han sido castigados adecuadamente, aun cuando hayan sido culpables. Arleen Rodríguez: Acaba de fallecer recientemente una persona muy vinculada al caso, que usted conoció bien, Leonard Weinglass; sé que usted sabe que era un hombre amante de la justicia y que luchó por ella, y sus últimos pronunciamientos, su último trabajo, incluso, en su lecho de muerte, estuvo encaminado a probar que los Cinco no tienen nada que ver con el derribo de las avionetas. James Carter: Sí, lo sé. Arleen Rodríguez: Entrar más en el caso haría más larga esta conversación, pero lo que sabe el pueblo de Cuba, lo que se puede probar, lo que saben, incluso, las autoridades norteamericanas, por todo el informe que trasmitió Cuba, es que esos jóvenes lo único que hacían era buscar información para evitar actos terroristas. Yo tengo la confianza de que usted también podrá trasmitir la solicitud de indulto, como un gesto humanitario. Estos hombres han sufrido mucho y han perdido familiares sin poder estar a su lado; en fin, no insisto, le agradezco su interés y sus declaraciones en nombre del pueblo de Cuba. Señor Carter, usted decía también esta mañana en la conferencia que tuvo un encuentro de amigos con el Comandante Fidel Castro, quien en sus reflexiones ha expresado mucha angustia por los riesgos que está enfrentando la especie humana, por los enormes arsenales nucleares que siguen creciendo y que están en capacidad de destruir varias veces al mundo, y también por las consecuencias nefastas que podría tener para la especie humana el cambio climático; son temas en que creo que ustedes tienen una amplia coincidencia. Como físico nuclear usted sabe lo que significa para la especie humana la posesión de armas nucleares, usted fue un presidente que trabajó mucho por educar a su pueblo contra el culto al consumo, promovió políticas de racionalidad, de defensa del medio ambiente, aunque lo hicieran impopular entre algunos sectores. Bueno, rápidamente solo quiero saber si cree que todavía hay oportunidad de hacer algo para salvar a la especie humana. James Carter: Cuando yo era presidente negocié con la Unión Soviética para reducir el número de armas nucleares, con los Tratados SALT I y SALT II y estuve muy a favor de que se redujeran los arsenales nucleares en ambas partes. También considero firmemente que representa una amenaza para todos los seres humanos este calentamiento global, y como usted probablemente conoce, el presidente Obama y su antecesor, el presidente Bush, estaban interesados en trabajar con otras potencias nucleares para reducir los arsenales, y se han estado supervisando de una manera muy estricta los acuerdos que han firmado estos gobiernos. Considero que Estados Unidos no ha sido todo lo firme que debía haber sido en el abordaje de los problemas del calentamiento global. Los funcionarios cubanos, desde que he estado aquí, me han señalado lo que se ha hecho con la parte vieja de La Habana, y he estado en Bolivia para reunirme con Evo Morales, y quizás Bolivia sea el primer país que sufra los principales daños a su economía, debido a que se están derritiendo los glaciares en las montañas de Bolivia, que significan una fuente de agua potable. Por eso espero que en el futuro este tema, como es el calentamiento global también, sea abordado por todas las naciones, y sé que Fidel Castro es también un promotor de este tema. Estuvimos conversando acerca de los pasos que se dieron cuando era presidente en Estados Unidos, y hemos estado conversando ahora y está hablando y tratando de utilizar sus conocimientos y su sabiduría como antiguo Presidente para el bienestar de los seres humanos. Estuvimos conversando, estuvimos de acuerdo en muchas cosas, y, sobre todo, hablamos también de este calentamiento global, y creo que puede haber posibilidad entre ambos países. Arleen Rodríguez: Le agradezco muchísimo. Gracias, cada vez que usted visita a Cuba las esperanzas se abren, aunque las relaciones todavía sigan siendo tan difíciles con el bloqueo. James Carter: Espero que podamos volver otra vez. Quiero traer a toda mi familia, somos muchos de familia, somos 36 miembros. Espero no tardar mucho y traer a mi familia. Arleen Rodríguez: Gracias, señor Carter, muchas gracias.